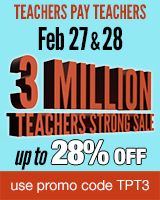 I’m sure by now, you’ve heard about the AWESOME Tpt sale that starts tomorrow!!! My two best selling products will be on-sale for 20% off during this sale, so be sure to put them in your cart if you don’t already have them!! I’ve updated it with 2 new games! The 3D Shape Do-a-dot Recognition game and the Roll a 3D Shape game are new to this pack! This pack is so easy to use…all you need is some BINGO stampers in the appropriate colors and some of these sheets and you are good to go! My kiddos LOVE using these sheets at the beginning of the year and get really good quickly at recognizing and naming letters and numbers.